Title: 'Indiae Orientalis, Insularumque Adiacientium Typus'. 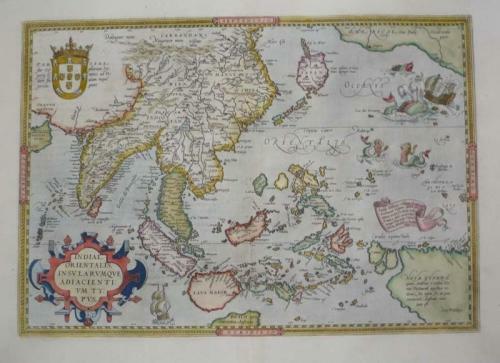 A fine map showing India, China and New Guinea with many points of interest: the map includes Beach and other information drawn from Marco Polo. The map also includes a portion of the West Coast of North America, including several mythical names in California. This map is based upon Mercator's world map of 1569. The difficulty of mapping this archipelago was such, that for centuries to come maps of the area remain faulty. Sumatra and Java are oversized, and the Philippines are incomplete (without the Northern island of Luzon). The mermaids are based on those occurring on Diego Gutierrez map of America. From the 1579 edition of Ortelius' Theatrum Orbis Terrarum, the first modern Atlas. Latin text to verso.